In the Fall of 2014, GEM was invited to pitch a program rebrand for the Regional Water Authority, or RWA for short. The mission was to examine the RWA’s non-core revenue programs: the PipeSafe water line protection plan, and the PipeSafe Plus sewer line protection plan - both of which covered service lines from the main to the home - in case of an emergency rupture. After winning the pitch, GEM went to work examining the RWA’s current state of affairs - the names of the services, current market share, and current consumer sentiment. GEM met with key stakeholders within the organization, as well as vendors who supplied services that dovetailed nicely within the boundaries of what the RWA could offer in its protection plans. After the research phase, GEM designed a new set of protection plans in two divisions: the Repair Series would give you immediate service in the event of a sudden emergency, while the Defend Series would give you frequent pipe cleanings to prevent a sudden emergency. With both series available, consumers could choose products based on their risk tolerance profile. 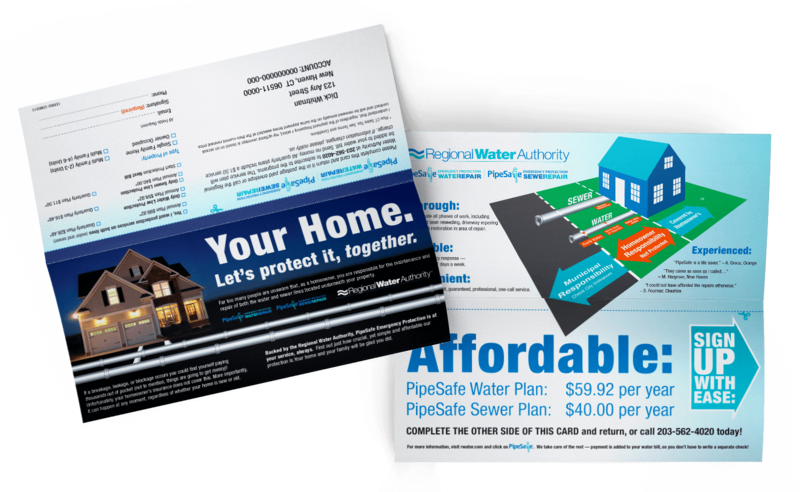 To begin crafting the Repair Series, GEM renamed the PipeSafe and PipeSafe Plus programs to eliminate any confusion between the water and sewer protection plans, as some consumers were inadvertently purchasing the PipeSafe Plus program thinking that the ‘Plus’ denoted both enrollments, when in fact it signified only sewer line protection. Brand heritage was very important to the RWA, so the creative and design teams took special care to incorporate the PipeSafe name into the new programs in order to both maintain market awareness and support existing materials that featured the brand, like their current fleet of branded trucks and vans. Then, for the Defend Series, GEM designed four maintenance plans including water, sewer, septic, and drainage. A responsive landing page made it easy for homeowners to get information and to sign up for Pipe-Safe services. With these brand new plans in place, the RWA could offer a program to every homeowner - no matter whether the homeowner had city water, well water, city sewer or septic. The advent of this program mix eliminated the need to divide the broader market into segments, since now every homeowner could receive the same market communication. This advantage produced media planning economies-of-scale that would not only have a positive financial impact, but that would also help to spread brand awareness in a broader way. Examining the media mix, GEM started by looking at all potential outlets and eliminating ones that had inherent inefficiencies in reaching the target market. Because the RWA is geographically confined in its potential market reach, most broadcast outlets were eliminated because the average reach was too large to justify the cost.